SEO Layered Navigation Plus and Price Slider for Layered Navigation allow you to combine 2 attributes in one slider - Min/Max slider. It is useful if you have products with attribute falling under some range, like width from to or weight from to etc. 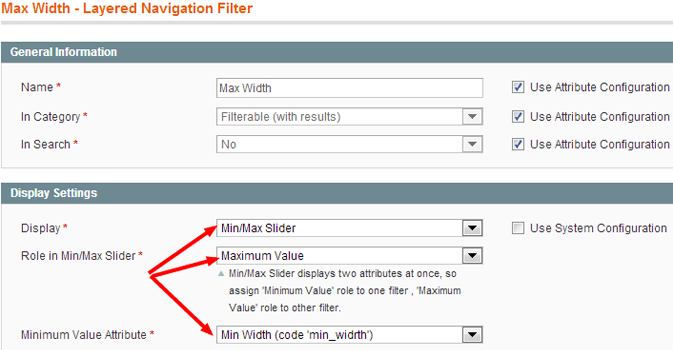 Then you can create 2 attributes like min_weight and max_weight and combine both in one slider of type Min/Max slider. After creating 2 price type attributes go to MANADEV->Layered navigation Menu and open the one which is going to play Minimum role in the slider or in other words - left range of slider. 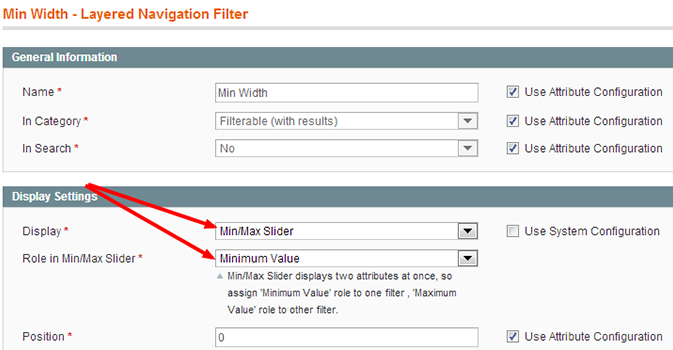 Set Display option to Min/Max slider and Role in Min/Max Slider set to Minimum value. Save it. Then open the attribute which is going to play Max role in the slider and set Display option to Min/Max slider and Role in Min/Max Slider set to Maximum value and in Minimum Value Attribute dropdown pair it with Minimum role playing attribute. Save it. Hallo ! I am very happy with SEO Ultimate Layer navigation, however i cant find a good way to set up height filter. If i set up attribute as "price" then RWD theme show € sign when i look at tabs - additional info beside height. I know that i can disable to show up in front, but i would like to have height on front under tabs. What type of attribute should i set up to filter height as a slider (like price) ? As you see, all three filters (height,width and lenght) show up as they shuld: http://i.gyazo.com/e02a77192947ab9e9274948dcd85c91f.png but as you see here are three values (height,width and lenght) have currency simbol : http://i.gyazo.com/1bbf544ee7408f244c5f35e9857170cf.png Question: what is best practice to set up slider for filtering product by min/max height,width and lenght ? Hello, Thanks for your feedback! We have sent you email, please check. Thanks for fast reply with working solution. Amazing support ! Hi, Pls write the solution for me too! Thx!